Last time we discussed my introduction to the use of Vardos in the SCA and today we will start investigating them, and their cousins. 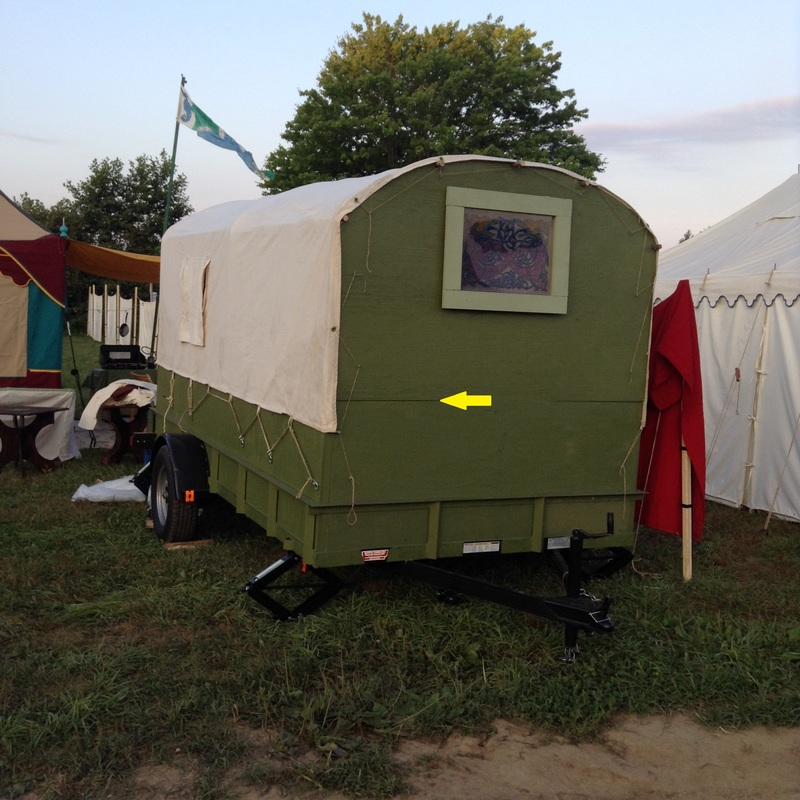 When I noticed that there were a ton of Vardos at Pennsic this year I decided to take an active look at some of the different type of wagons that were out there and what they were being used for. Because I am actually running a shop in the market I know that I did not even come close to seeing all of the Vardos and other wagons, but I tried to investigate some that I remembered were not standard living quarters, because that may be a unique concept for some folks. I am also going to mention a few things that I think Vardo owners need to consider when building and parking their Vardos. The first thing that I noticed this year was this Vardo that arrived right across the street from our encampment. When it arrived it just looked like a box, and there was nothing above the seam in the wood that I have marked with a yellow arrow. When I came back later in the day, there was a canvas cover on the wagon that had turned it into a place to live. I spoke briefly with the owner at the end of the war and she said she thought it was probably going to undergo a complete rebuild. I suggested that she put reflector tape on the tongue of her trailer or possibly add a solar lantern so that people could see it at night. I had watched multiple people and cars come within a very small number of inches of crashing into the tongue of her trailer in the dark. It had been parked too close to the road by the people who transported it, and the tongue was black with no reflectors. Looking objectively at the canvas, I think it would have leaked badly if there had been a serious rainstorm with wind. This is an excellent example of why we should look at historical wagons. Think of the Conestoga wagons that the pioneers in the western US used. The canvas on those wagons wrapped completely around the corners so that driving rain could not get in easily. This picture shows the sort of Vardo that I see in Arizona, although the ones that I have seen usually have a tighter cover. They are sort of a miniature version of a Conestoga wagon. The canvas cover is on all of the time. I did not have a chance to chat with the owner of the this Vardo to see if they drive the Vardo with the cover in place. The big advantage that I see to always having the cover on is that the Vardo is ready to use almost instantly when you arrive, just like our old RV used to be. 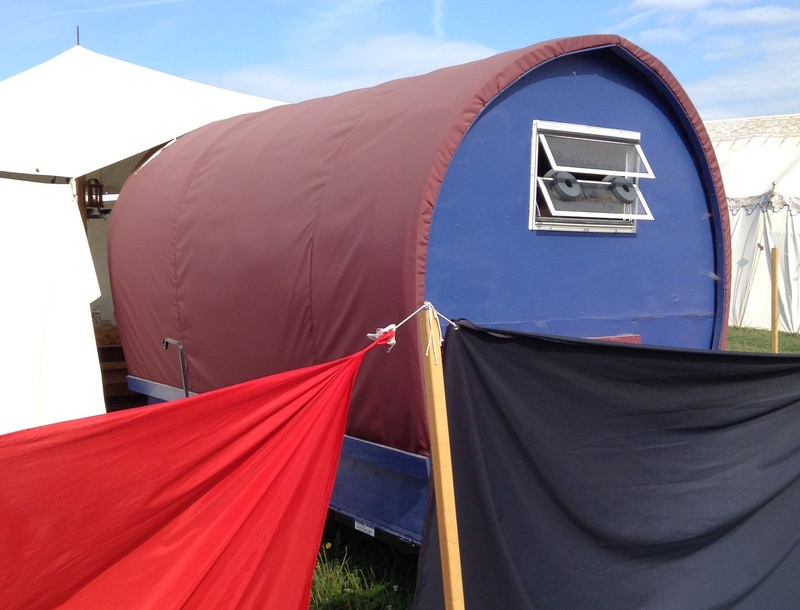 The first Vardo that I ever saw at Pennsic, was a very different design. 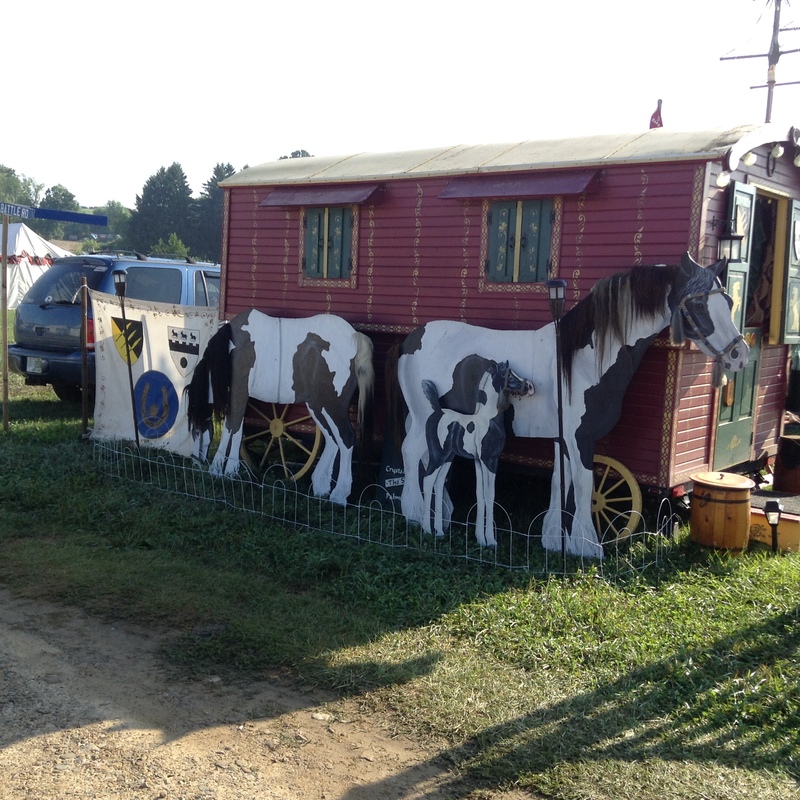 This entry was posted in Camping, SCA Life and tagged Gypsy wagons, Vardo camping, Vardos by Eirny. Bookmark the permalink.